Le Mont Ubé dolmen, St. Clément, with SE rock types. This link is included to offer another type of Geology Trail. The sites and their monuments provide interesting areas of study concerning the surrounding rock, the rock types used related to their nearest outcrop or availability and the use of the topography resulting from Jersey's tectonic history and the various weathering and erosion processes which have acted on the site. For example, the Palaeolithic rock shelter, situated c.10m above present sea level, occurs under an overhang caused by erosion along an inclined master joint in the SW Granite which allowed access for the people and given the finds, possibly an ideal situation for the animals to have been driven over the top of the cliff on the opposite side. In contrast, the cave on the north coast, situated at about the same height above sea level, is a fossil sea cave eroded when the sea level was higher during an interglacial period. Elsewhere, the dolmens and other Prehistoric monuments in the different parishes each have their orthostats and cap stones of rock generally found nearby, which make an interesting study in terms of determining their local provenance. For example, which rocks were used to construct La Hougue Bie, La Pouquelaye de Faldouet, Le Couperon and Le Mont Ubé? The many flint tools and hand axes seen in the museum again can be studied to determine their composition and then to research their provenance. Jade hand axes have been found at several locations and in 2009 they were included with others from NW Europe at conference in London which discussed the possible Alpine origin of the jade. Bronze hoards have been found and a study of the sources of the copper and tin provide interesting information on provenance. The pottery and even gold from the Iron Age have been studied for the types of clay and trace elements to determine their origin. At present, the Archaeology Section of La Société Jersiaise is establishing an archive of local bricks and relating them to the clay and brick-earth deposits in Le Mont à l'Abbé, Five Oaks and Maufant areas, just north of St.Helier. There are several reports on the geology of the masonry in the various dolmens, manors and houses in Jersey, for example, the use of granites from Les Minquiers, Chausey and Les Écréhous, but further studies of the churches, sea walls and harbour walls would provide interesting geology trails. The following few selections give more references with detailed information. Mourant, A. E. 1977. 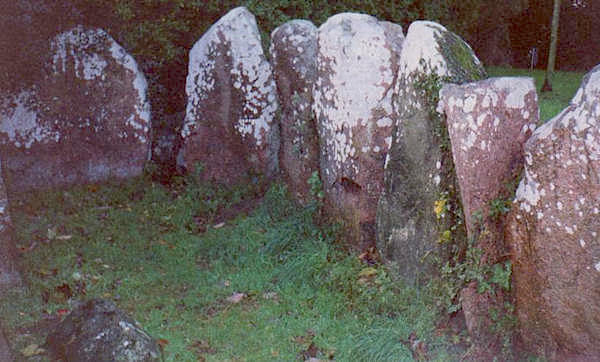 The use of Fort Regent granite in megalithic monuments in Jersey. Ann. Bull. Soc. Jersiaise. Vol. 22. Pt. 1. p. 41. Renouf, J. T. 2002. The age of house facades in Jersey, Channel Islands, from masonry style and rock type with other observations on rocks used and their sources. Geosience in south - west England. Vol. 10. pp. 329 - 335.